Gordon Brown says he wants a national debate on whether to change the system of organ donation. He believes thousands of lives would be saved if everyone was automatically placed on the donor register. It would mean that, unless people opted out of the register or family members objected, hospitals would be allowed to use their organs for transplants. But some critics say the state should not automatically decide what happens to people's bodies after they die. Currently there are more than 8,000 people waiting for organ transplants in the UK - a figure which rises by about 8% a year. Writing in the Sunday Telegraph newspaper, the prime minister said a system of "presumed consent" could make a huge difference. "A system of this kind seems to have the potential to close the aching gap between the potential benefits of transplant surgery in the UK and the limits imposed by our current system of consent," he wrote. The system already operates in several other European countries and has boosted the number of organs available for transplant. Mr Brown, who carries an organ donor card, said he hoped the measure could be introduced. Lib Dem MP Dr Evan Harris, chair of All-Party Kidney Group and member of the BMA Medical Ethics Committee, welcomed Mr Brown's comments. "Under an opt-out scheme donor's real wishes will be more often respected, more lives would be saved and grieving relatives will be spared the experience of making the wrong decision at the worst time," he said. Mr Harris said too many people were "needlessly dying while waiting for organs". Scottish Health Secretary Nicola Sturgeon, re-stated her position that she was "sympathetic" towards a system of presumed consent. She said: "More Scots have put their names on the Organ Donor Register than in any other part of the UK. "Despite this, Scotland still has one of the lowest organ donation rates in the EU and it's clear that we need to do much more to increase the number of donors." However, several patient groups, including Patient Concern, are against a system of presumed consent, arguing that it is not up to the state to decide what becomes of people's bodies when they die. Joyce Robins from Patient Concern told BBC Radio 5 Live presumed consent turned volunteers into conscripts and that proposals did not tackle the problem of donor shortages. "Presumed consent is no consent at all. We've worked for years to get a system of proper, informed consent in the health service in this country and Gordon Brown is willing to throw it all out of the window," she said. 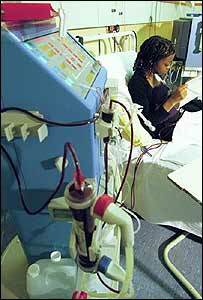 The Organ Donation Taskforce, set up by the UK government in 2006, is due to publish its report on Tuesday. It will make 14 recommendations, which it is hoped will boost the level of organ donations. However there will not be a report on the issue of "presumed consent" until the summer. The new proposals include doubling the number of transplant co-ordinators in the NHS to 200 and employing and training them centrally rather than by individual trusts. Co-ordinators identify possible donors, talk to bereaved families and inform the national transplant list. Dedicated organ retrieval teams available 24 hours a day would also be established to work closely with the critical care teams in hospital. The taskforce says an extra 1,200 transplants could be done each year, which it says could save the NHS more than £500m over 10 years. This is because dialysis for kidney failure patients costs £25,300 a year, whereas a transplant costs £45,900 initially followed by annual treatment costing £7,100. Health Secretary Alan Johnson said: "Last year around 2,400 people in the UK benefited from an organ transplant, but more than 1,000 people die every year waiting for a transplant. "These recommendations are an essential first step to improve the systems supporting organ donation."